The Global Gender Report (2018) brings out how the average global gender gap is 32%; with India having to bridge a gap of 33%. The parameters include economic participation and opportunity for women, their education, health and survival and political empowerment .Such deprivations clearly stultify human development capability. There have been few studies that address impact of women’s education on their economic, social and psychological empowerment. This book tries to fill up that void by taking up a rigorous research survey of the rural and urban landscape of Odisha. It uses sophisticated research techniques like Structural Equation Modelling (SEM) to distil the biases that creep in surmises and loose hypotheses .At the same time, it takes care to ensure that simplicity and lucidity is not lost sight of for the avid reader, who lingeringly looks forward to substantive findings. This book is a pioneering effort to marry qualitative with quantitative research; with an eye on enjoyable reading. Gender justice has predominant challenge flaring from the manifold challenge; with patriarchal mind- set that obfuscate rational discussion. This contribution will hopefully close the chasms that divide perceptions from reality, facts from fiction and pave India to a more empowered and gender sensitive India! 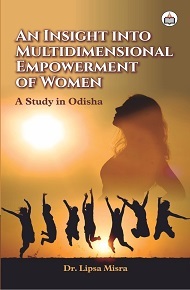 Dr. Lipsa Misra is an Assistant Professor of Economics in Buxi Jagabandhu Bidyadhar College, Bhubaneswar, Odisha. She has been actively involved in teaching undergraduate students with more than 19 years of experience. Her core areas of interest are international studies, gender studies, behavioural economics and social sector issues. She has authored and co-authored several research articles in leading journals of national and international repute. She has also authored chapters in edited books on gender studies and agricultural reforms. The author has attended several seminars, symposiums, workshops and conferences organised at different universities and by different institutions. She has presented research paper in international seminar as well. As a responsible citizen she has been involved in development of rural women working in the unorganised sector in Bhubaneswar, Odisha by guiding them & training them to work with dignity and improve their negotiating powers at work place as well as at familial levels.